Scotland secured a dramatic, but deserved Six Nations win over Ireland, thanks largely to a stunning pair of tries by Stuart Hogg, and one from Alex Dunbar. Ireland fought back, though, with tries from Ulstermen Iain Henderson and Paddy Jackson, but Greig Laidlaw won it for the hosts with a pair of late penalties. Despite retreating at an alarming rate at the first two scrums, Scotland made a blistering start with ball in hand, which led to the game’s first try. A wonderful team move, orchestrated by Finn Russell, saw Sean Maitland burst up the wing, before the forwards took the hosts into the Ireland 22. 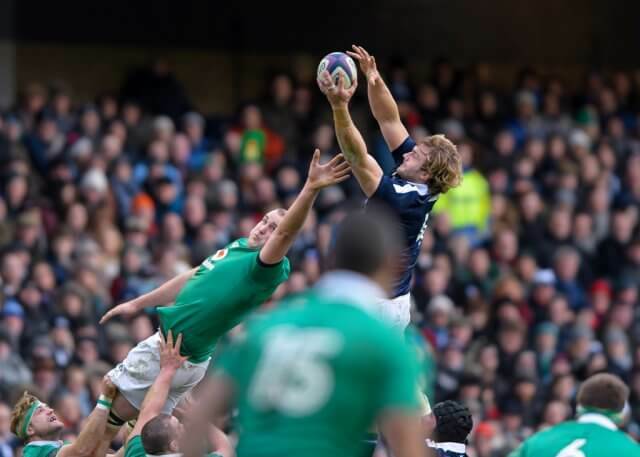 From there, Hamish Watson’s powerful carry drew the Irish defence, allowing Russell to float a pass to Stuart Hogg, who dived over for his 14th Test try. Laidlaw converted. The champions of 2015 responded well, and dominated both possession and territory in the rest of the opening quarter, but as it drew to a close, Scotland led 7-0. Then, another moment of Scottish magic and no surprise it was that man Hogg who rounded off a wonderful move to score his second try of the half. From a lineout on the Ireland 10m line, the ball was worked down the left wing by Huw Jones to Hogg, who, with only Rob Kearney to beat, sold his opposite number the dummy and sprinted clear. Laidlaw was on target again to make it 14-0, but as they did after Hogg’s first effort, Ireland responded well. They put together another sustained period of pressure, and with Romain Poite playing advantage, worked the ball to the left wing, where Keith Earls went over. Paddy Jackson, who endured a horror show off the tee at Murrayfield in 2013, missed a tough conversion. It was an exhilarating opening 40 minutes, and Scotland edged towards the first-ever Six Nations bonus point with a third try on the half hour. A clever lineout move, with Alex Dunbar helping his pack colleagues out, saw the Glasgow Warriors centre collect the throw, and he burst through to score. Laidlaw added the conversion from the right touchline, to give Scotland a 16-point lead. As Ireland built pressure in the Scotland half once more, Poite awarded the visitors a penalty, allowing Jackson the chance to cut the gap, and the Ulsterman obliged (21-8). Scotland pressed on the stroke of the break, only for a loose pass to be intercepted by Simon Zebo. The Munster wing kicked ahead, but Scotland were saved by the retreating Tommy Seymour, and Laidlaw kicked the ball to touch for half-time. Ireland started the second half strongly, and won a succession of penalties inside the Scotland half, with Rory Best turning down an opportunity to kick at the posts twice inside four minutes. Instead, Ireland took a scrum 5m out, and that decision paid off three minutes later, when Iain Henderson barged over. Jackson converted to cut the difference to six (21-15). Scotland nearly shot themselves in the foot for the second time, as Russell’s grubber was blocked by Conor Murray, who fed Heaslip, but the veteran number eight couldn’t find a team-mate as Sean Maitland spared his colleague’s blushes. Rob Kearney provided Ireland with a moment of magic, as he skipped through, before offloading to Earls, but another wonderful Maitland tackle forced the full-back into touch. The Scottish resistance finally broke with 17 minutes to play, as Jackson carved a great line and escaped the clutches of Strauss to score, before converting to give Ireland the lead for the first time (21-22). Vern Cotter’s men were clinging on thereafter, with limited possession and no territory to speak of as Ireland took charge – albeit without adding to their total. A rare home attack, and a huge carry by John Barclay following a similar effort by Zander Fagerson, yielded a penalty, which Laidlaw landed to give Scotland the lead once more, with just seven minutes to go. Ireland were lucky not to lose Kearney to the sin-bin for a high tackle on Dunbar, and instead of taking the points, Russell kicked his pack to a 5m lineout as they searched for that fourth try. Another penalty ensued, and Laidlaw sent the ball sailing through the posts to seal a famous win – a first on the opening day of the Championship since France were beaten some 11 years ago. 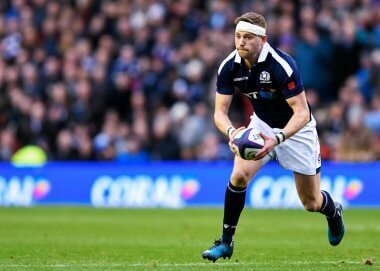 Scotland: Stuart Hogg, Sean Maitland, Huw Jones, Alex Dunbar, Tommy Seymour, Finn Russell, Greig Laidlaw (c); Allan Dell, Fraser Brown, Zander Fagerson, Richie Gray, Jonny Gray, Ryan Wilson, Hamish Watson, Josh Strauss. Ireland: Rob Kearney, Keith Earls, Garry Ringrose, Robbie Henshaw, Simon Zebo, Paddy Jackson, Conor Murray; Jack McGrath, Rory Best (c), Tadgh Furlong, Iain Henderson, Devin Toner, CJ Stander, Sean O’Brien, Jamie Heaslip. Brilliant! Just brilliant! Genuinely thought after we went behind there was no way back, Ireland just weren’t making any mistakes, but somehow we found the character to win! Six Nations rugby is all about momentum and now I honestly think we could win 4 games. Totally brilliant. Fantastic team spirit and guile especially in the last 10 minutes. Irish gave us a proper test but now this Irish monkey is off our back I genuinely think this could be our moment. Their won’t be a more difficult defence to break down. Even Weir played his part. Immense performance from Hogg and J Gray. What players! Great game. I thought Dunbar was really good today – yet oddly his stats say he missed 5 tackles. Shows you the difference between stats and perception! Defensively we appeared to do a great job stopoing their big ball carriers (see below) and showed in attack we can score of early phase ball. Very pleased with the result. Onwards to France – big pack is a worry but also possible a weakness if we can get quick ball. I thought Fickou was poor in defense so will be interesting as to whether he plays next week. If we can do the same to Picamoles as the Irish ball carriers then we are in with a shout. Again stats suggest i might be wrong as Irish back row made 141 metres so maybe we didnt do that well at stopping them! Suppose it comes down to where those metres are made and whether the support runner is there – maybe got a bit lucky on that front but overwhelmingly positive that we went behind and came back and won. Not something we have done very often! Excellent result. What a good win against an excellent Ireland side. That last ten minutes of play showed we are maybe ready to dine at the high table of rugby again after feeding on scraps for so long. Favourite moment for me today at Murrayfield? Ireland fans kicking off Fields of Athenry and never getting to the end of that dirge as Scotland kicked in for the last ten incredible minutes. Brilliant performance. Only time will tell if it’s a one off performance this championship, but with that team I doubt it! Pride back in Scottish rugby! 1- Dell ‘needs’ Ford rather than Brown at scrum time. So Dell/Ford and Reid/Brown. 2- Outside centre is still up for grabs….neither Jones nor Bennett really made it theirs…any word on Taylor? 3 -Once again, Laidlaw proved his place. Until Russell can kick >90% and Jonny can captain with certainty, can’t see Price being first choice. Actually think Swinson did a good job at 8 when he came on. He’s been playing so well for Glasgow it seems a pity there isn’t a place for him to start but you cant argue with the Gray boys on current form. Maybe he should play a bit more at 8. Agreed, Swinson is in top form right now and he didn’t disappoint when he came on. After the first couple of scrums Scotland definitely sorted it out a bit. There were a couple of very solid holds close to our line. I think you are right the combinations are important. I wouldn’t be surprised if its Reid/Brown/Fagerson that start against France with Dell/Ford to come on when the French tire. Fagerson is going to get a lot of minutes in this championship. That Irish front row was seriously good. Furlong looks favourite for me to start with the Lions but Fagerson, other than one slip, held his side up well. This was more than anything a TEAM EFFORT, a very sweet win and an epoch-changing game – where picking out the stars is a mugs game. Those that stood out in the dramatic moments thanked humbly those that enabled them. For me the tries were very well taken, but the real character of this squad really showed in the defensive work – especially when they were really under the cosh in the second half. The last minute surge into enemy territory with points on the board is normally something only Munster do. WOW proud to be Scots tonite!!!! Excellent performance from everyone, huge defensive effort to resist ireland’s attritional play. Nice to see them fail to batter us into submission, especially after some of the close Glasgow-Munster games. Massive effort by the pack to keep stander, heaslip and to a lesser extent sob quiet without their usual tackle-breaks the irish struggled to get on the front foot. Our backs showed their class, Finn, Dunbar, Hoggy all had the edge over their opposite numbers. Murray also box kicked less – maybe still rattled after Glasgow’s treatment the other week!?! Special mention to maitland for appearing in the right place at the right time (no wonder sarries like him) and also wee duncans little cameo! Maybe box kicks went off the menu not so much for being rattled…but afraid of giving the ball to Hogg or Seymour…irish backs were like rabbits first half. Also respect to the irish fans – reading on other forums -mostly graceful in defeat, nice to see scotland getting some respect for their performance. Yes, applause for the guys on Planet Rugby. Yes, I agree about the comments from Irish fans. It was a great test match and most commentary agrees that Scotland thoroughly deserved it. Every performance magnificent. Scotland regained many fans yesterday and not just scots. Vern was brave enough to play his on form players, Laidlaw showed us why BVC backs him. For me the maturity to hold the line in the last 10 minutes finally arrived. I think the greatest compliment here , is to say no more , at last there is nothing more to say. Real maturity in those final moments and perhaps we are discovering ways to win. Cardiff 2010 no more. Barclay’s skill on the ground crucial when Ireland had us under the cosh in our 22 was a momentum shift in the Scots favour. Canny decision making from Laidlaw with last two penalties and an eye on the clock evidence too that a clinical edge is emerging from the Cotter era. Working from memory as a spectator yesterday (won’t be able to watch it again until I get back to England), am I right in recalling that in the closing few minutes, Conor Murray gifted us possession two or three times with poorly executed kicks that gave his chasers no chance to compete for? If so, thank you, Conor! Yes, a couple of poorly executed box kicks gave us possession back. The sort of thing Laidlaw regularly gets pelters for. I thought Murray had an indifferent game yesterday, but was not being given the service from his pack that usually allows him to dictate a game. Instead he was playing off slow ball and struggling. Contrast to Laidlaw, who looked very sharp in the first half, and seemed to revert to his perceived type in the second. The big difference was the speed of presentation of ball for both 9s. Is it also worth noting that Murray may have spent much of the game wondering when he was going to be unfairly and despicably targeted for having the ball by nasty Scottish players. I only saw one instance where Jonny Gray got anywhere near him, but it makes you wonder if it was preying on his mind. If that is the case then serves him right for whining about it all week in an attempt to influence the referee. Thanks for the confirmation, Ade, and for the additional comments that made me chuckle. 1. Our best performance under high ball for a long long time. Despite a couple of unlucky bounces (Russel crashing into own player), we generally gobbled up everything put in the air. 2. Maitland’s finest Scotland performance for me. Generally mister average, he was hungry and tireless yesterday. 3. Vern Cotter should get credit for his bench selection. Losing in last 10 mins isn’t just down to nerves… we’ve also typically been bringing on less talented, less experienced players into the last 1/4 of matches. Ford, Barclay and Swinson off bench really helped keep a balance. Duncan Weir, although only made a cameo yesterday, also part of the selection policy. Think back to Argentine (2 missed dropped goals), and Munster recently (no thought of drop goal despite it being the obvious choice)… Russell great for the first 70, but might we actually have preferred Weir for last 10 of both those games? 4. Re-watching the match i think it’s the best we’ve played at the breakdown for ages. Even in the depths of the 2nd half when Ireland were on top we consistently slowed down Irish ball that crucial half second (while, generally, not the half second extra that concedes penalties). A fair point about Weir actually. The guy cannot operate a backline the way we want our stand-off to, but he is a solid drop kicker and touch finder; two skills good for closing out a game. 2 penalties in the whole of the 2nd half against that pressure. Brilliant! Weir done a surprisingly good job when he came on… Promising? Thought Scotland were actually the best team playing this weekend. Certainly the team playing the most positive rugby. France are trying to change the way they play but not quite there yet. Really inconsistent (shock) and seem to have the old Scotland problem of being unable to win when it counts, even after putting in a good performance. England nowhere near the side they were last year but have a lot of injuries and I suspect with Jones in charge and the number of high class players at their disposal they’ll continue to win. Wales were dire and for a team averaging 45 caps and with the lions backs coach in charge seemed completely clueless going forward. Much better when Sam Davies replaced Bigger but had to rely on the proven class of Liam Williams and North to bail them out. A tremendous victory, an enthralling nail biting curates egg of a test match. I don’t know if the Irish were overtly wary of giving Hogg, Seymour ball as they were averse to kicking it long from the outset. Hogg’s 2 tries really knocked the Irish off their game & it took the 1/2 time break for them to recover, Irel;and were much better in the 2nd half but the much maligned Laidlaw (hands up I was wrong) played a captains role (so much so he must be in Gatlands thoughts). Kenscot makes a very good point re replacements – Barclay, Swinson & Ford were all excellent & fundamental to the winning penalties. Hardie will likely feature next week I reckon. Scotland rugby team KNOW how to beat teams that THINK they can’t be beat, all the Scottish team involved know how it happens. For me, the most special moment was when flower of Scotland started to swell once Russell opted for the kick at goal. The anthem grew throughout the stadium and had less a tone of a battle cry and more an euphoric celebration chant. The closing lines of the song ended just as Greig kicked the goal. Truly beautiful! You could sense the release from every fan in the stand!! So chuffed for the boys in blue! Good old Irish Times; ALWAYS magnanimous in defeat….. It put a smile of my face. Wow, the hurt is strong. Short of a try bonus point it seems to have been the most perfect start. We got the win, we scored tries when we managed to play with ambition in the opposition half, we don’t seem to have anyone injured and definitely out for the France game, but just as crucially in my humblest of opinions we have plenty of things that didn’t go well – absolutely no complacency and the knowledge that despite beating one of the favourites there is still so much more to come ! If they can shore up the scrum and look to earn more possession around half way / French 22 then I genuinely think we could go to France and do something special. There is pressure on both teams, but we had a bad 30 minutes against the Irish and won, they had a bad 15 minutes against England and lost – we should be the ones looking to improve knowing that if we get it right we could just about do it !!! To be honest I think the third quarter against Ireland provided a strong caveat for our ambitions against France next week. The two halves might be the inverse of what happened on Saturday, i.e. that we will be defending against a French onslaught in the first half but then, having weathered the storm with little damage, we break loose in the second. We may need strong ball-carriers like Tim Swinson (playing at six) to counter French physicality. Our scrummage definitely settled v. Ireland after the first few setbacks……..but we cannot afford to give the French any psychological advantage in that area from the off. I’ve seen a few references by the Irish to Scottish “chat” in the lead up to the game and Laidlaw’s name mentioned. What is that about? No one really knows. The best we can see it was Greig defending Strauss and Jonny against the (Irish) accusations of them trying to injure Murray in the Glasgow v Munster game. I would hope Greig saying in the standard interviews that he thought Scotland could win would be allowed and not classed as mouthy, surely?! There’s a weird sense of entitlement/over-reaction that seems to take hold of successful teams. You could see it in some Welsh supporters after they won Grand Slams (a kind of obnoxious beered-up superiority) and in some of the Irish supporters/pundits as well recently. My guess is that the same thing would happen from some Scotland supporters if we have sustained success – many of those those who tend to nurse a sense of insecure grievance (“the refs always against us”) will probably flip to arrogance and taunting opposition. It’s one reason I’m really grateful for the usually fair, realistic, balanced, big-picture discussion on this blog. The Irish press is parochial and totally over the top. They spun the usual bland responses at press conferences into a whole gamut of perceived slights by Laidlaw, Townshend, Glasgow etc. they claimed we had a specific plan to target Murray in the match, as we had against Munster, that we were underplaying their victory against the ABs, that we were being cocky and hyping ourselves up etc. etc. now they are banging on about Scottish Police deliberately delaying their bus, us cheating at the breakdown and putting the loss down to them blowing all their chances. It doesn’t reflect what most rugby folk think and it doesn’t really help their team. Not only were Ireland quite complacent but Murray in particular was off. I always respected Schmidt but to be honest he seems to go in for this media games stuff and has been bizarrely referring to the bus issue at every opportunity. I only spotted one even half-hearted attempt to pressure Murray so if they did put the kosh on they were a lot more subtle than Glasgow! A lot of the bile (Neil Francis et al) is probably due to their shock at losing to a side that hasn’t threatened them for a VERY long time. I think they thought their dominance would last forever. Did we think that through the 80s and 90s or were we more grounded? I can’t honestly recall if we were cocky about it but I do remember thinking that a win was pretty much a given. Here’s hoping that we have reached parity with them now and the days of green superiority are now over. 1) Although the Scottish tackling was often outstanding, there were poor defensive errors/missed tackles in the build-up to key Ireland attacks: Russell over-committing, (and, to a lesser extent, Dunbar missing a tackle) on Jackson a few phases before the first try; Jones badly missing Kearney before Maitland’s try-saving tackle; Bennett badly out of position creating the gap for Jackson to score – although it was a brilliant angle from Jackson – Bennett didn’t lay a hand on him. 2) Anyone else notice how the Irish wheeled their scrum a couple of feet left before each scrum to start at an angle every time, then ‘chased’ forward after the hit (which is illegal, pointed out by Paul O’Connell) and straightened, causing the Scottish pack, especially Dell, to hinge left and buckle. Why did Laidlaw or Scottish pack not insist on a straight/level starting position? A lot of paddies moaning about our boys ting on the ball at the breakdown. Perhaps, but how about their lads, Toner in particular, taking players out beyond rucks, throwing forward passes, closing the gap in lineouts, wheeling scrums, etc. They’re just hacked off that maybe our cheating nullified theirs. One particular arse BTL in the Grauniad quoted territory, possession and metres gained by Ireland to demonstrate how dominant they were. He failed to acknowledge that the vast majority of those were earned in a 25 minute period after half time. I don’t think we can say Scotland were perfect. I would actually say we played slightly worse than we did against Australia but the difference is that we won this time. We can win our home games against Wales, who benefitted from a dreadful Doyle refereeing display, and Italy, who are improving but are still beatable. Just re-watched the game. Lovely to watch a recording when you know there’s a happy ending. I think I can better understand now the frustration of Irish fans and journos, and how some of that frustration found its expression in post-match wailing and whingeing. It’s just over ten minutes to go. They’re now leading and have a great opportunity from a line-out close to our line to turn that into a probably unassailable lead. But after that crucial Barclay turnover, we absolutely battered them and they could find no way to come back. Welcome to the Frustrated Fan Club, Ireland! Hope the rumours of injuries are just rumours. A mighty battle ahead of us now in Paris on Sunday. Any updates on Dickinson and Sutherland? Are they expected to play some part in the campaign? Prager, my seat was right on the Scots 22. We all screamed ‘Forward!’ when the pass was released. I watched the Ireland match at a Bar/Pub just south of Cincinnati, Ohio USA. I am new to the sport and am just learning but Scotland has a fan here in Northern Kentucky. Clearly a man of wit and distinction. Just don’t expect it to be easy. Being a Scottish Rugby fan is mainly hope followed by crushing disappointment and frustration. But when we actually win it so glorious. Now go spend an hour YouTube watching up Jim Calder try v Wales 1982 and you’ll get it. Watching Wales take on England. I’m pulling for the Welsh. Both teams look strong. Looks like about 50 watching at this pub….50% Welsh fans. Hope for the same turnout tomorrow for Scotland!